A devastating disaster that burned down 95% of the city. 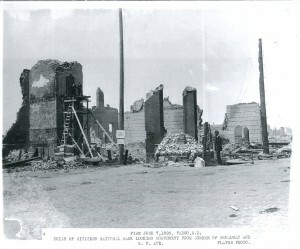 n 1893, Fargo was destroyed by a devastating fire. Whatever the origin, Sam Kelley spotted the fire from the waterworks in Island Park. He pulled the alarm to alert the city to the fire. Unfortunately, such communication only indicated that a fire existed and did not provide information specific to its location. Wallace Rice, a volunteer fireman who was working west of Broadway, rushed to clarify the location. The key to the fire alarm box was located in Sundberg Jewelry Store. Unfortunately, the clerk in the jewelry store had no idea where the key was to allow for the identifying alarm to be sounded. Rice alerted a nearby police officer to the concern, and finally was able to activate the alarm. By the time they had accomplished this task, the Yerxa Hose Company arrived on the scene. Some individuals indicated consderable concern with the oncoming fire, but most found comfort in the belief that Fargo had an exceptional group of firefighters. The flames quickly spread from to the Little Gem restaurant and then to nearby buildings. One of the buildings was a gun store, and the inventory included a keg of powder and innumerable cartridges. When the fire reached this inventory, an explosion of powder rocked the afternoon air and multiple cracks from the exploding cartridges followed. The fire reduced the wooden buildings to ash in a very short period of time. The fire destroyed nearby buildings, but missed Crane’s restaurant, although the intense heat marred the facade and destroyed the windows. The fire might have ended if not for the winds that assisted the flames in leaping across Front Street to take hold of Magill’s warehouse. According to John Hannaher, pieces of twine were on top of the warehouse. Those on the scene fighting the fire turned their attention to the warehouse, but pieces of twine on the top of the warehouse caught fire and spread throughout Broadway. At that point, the winds propelled the fire on a path of devastation through the Fargo business district. The fire moved toward the Western Union offices, setting one of the few brick buildings in Fargo ablaze. By this point, the residents of the business district had realized that the fire was out of control. Their efforts turned to attempting to save items of value and import from the oncoming flames, even recruiting those that were watching the fire to aid in the efforts. The fire spread to the Red River Valley Bank Building, and it was soon destroyed. The nearby Fargo Forum building was the next to go as the fire continued. The flames spread east from the Magill warehouse toward the harvesting warehouses on N. P. Avenue and Front Street. The Argus would later provide a vivid description of what onlookers saw, noting, “Hell itself could not have presented a more terrible picture.” Winds continued to stymie the efforts of those fighting the fire and again propelled the fire to leap across N. P. Avenue and consume the opera house block. Buildings on this block included the Fargo Opera Hall, the Merchant’s State Bank, Hellberg’s Jewelry Store, Yoder and Lewis Grocery, the Great Northern Express Company, and a variety of professional offices. The fire continued unabated, moving north to the Republican building, home to J.J. Jordan’s Evening Republican newspaper. The block was totally destroyed with little saved. From the Republican block, the blaze went across Second Avenue and engulfed the ornamentation of one of the businesses. Then the blaze spread to the Keeney block, owned by N. Stanford and Alexander Stern. The fire destroyed a wide array of businesses on its rampage, including Freeman’s China Hall Tea Store, Kop Brothers Music House, as well as the Alex Stern Building. The flames reached the Masonic Hall on the Stern block, destroying everything in the building (including the extensive Masonic Library). The destruction continued through to Alex Stern’s Palace Clothing Store and the legal and judicial offices above the clothing store. On the corner of Broadway and N. P. also stood the Citizens National Bank, which withstood the fire longest. Firefighters from as far away as Casselton were by that time tending to the blaze, and they concentrated their efforts on this location. The basement of the building included, somewhat ironically, the Thomas Baker Jr. Fire Insurance offices, and the second floor housed the United States Court Room. The fire continued west, destroying the Elliott Hotel. In only two hours’ time, the flames progressed over a mile through the city and set approximately two hundred buildings on fire. Some brick buildings had been constructed, but there were far more wooden buildings, and they readily caught fire. The wooden structures stymied the efforts of firefighters to stop the flames that swept through the city. Nonetheless, the fire ran its course by 7 p.m. In less than five hours, approximately 160 developed acres of Fargo were destroyed. Fargo Forum (Fargo, ND), June 7, 1893. John Hannaher oral interview, NDSU Institute for Regional Studies. Thomas Hannher’s “Fargo Fire Memory”, NDSU Institute for Regional Studies. 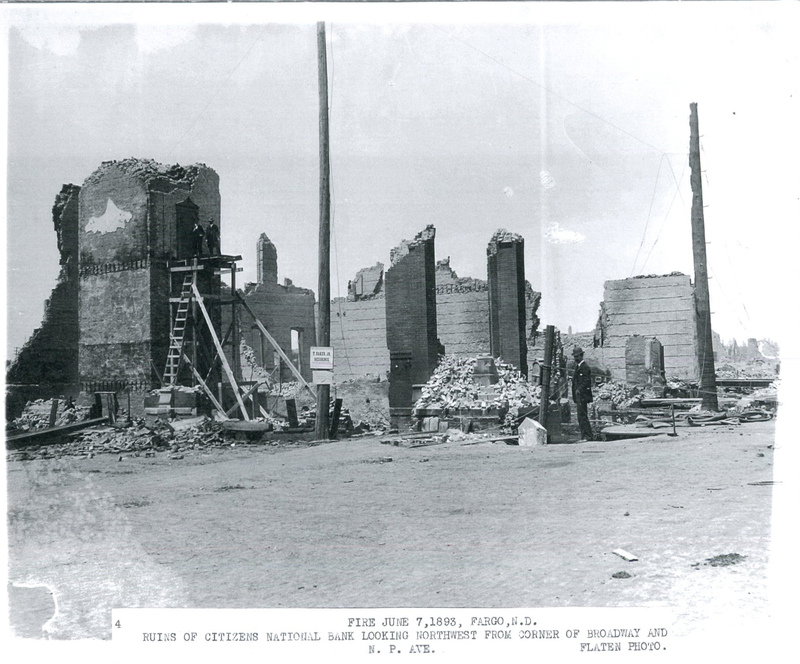 Image of Stern block destruction, NDSU Institute for Regional Studies. Image of destruction of Citizens National Bank, NDSU Institute for Regional Studies.